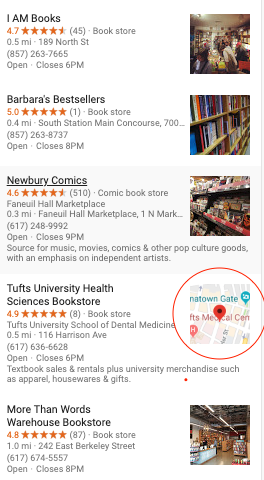 To get the full benefits of a Google Maps listing, you’ve got to make sure you’re not just on Google Maps, but ranking at the top of Google Maps. In this article, we’ll walk you through how to get on Google Maps and what you can do to your website and Google My Business listing to get your business showing up higher in results. Why Rank Higher on Google Maps? When someone performs a Maps search for the products or services you provide, does your business show up? If so, where does it show up? Whether on desktop or mobile, consumers rarely look past the first few results when performing a search, so it’s crucial to make sure your Google Maps listing is optimized to show up first for relevant searches. Keep in mind that regular Google Search results pages also display local results whenever applicable, so ranking higher on Google Maps equates to ranking higher on Google Search as well. So how do you get your business listing to show up higher in Google Maps? The secret lies in your Google My Business listing. How Do I Get on Google Maps in the First Place? To rank higher on Google Maps, you’ve got to get your business on there in the first place. 1. Search for your business in Maps. 2. If it appears, claim the listing. 3. If it doesn’t appear, add it as a place to Maps and then claim the listing. To claim your listing and make the necessary edits and additions to rank higher, you’ll need a Google My Business account. For specific instructions, head to How to Create, Claim, and Verify Your Google My Business Listing. The status of your business’s ranking in Google Maps correlates directly to the completeness and accuracy of your Google My Business listing. This is because Google wants to be able to display as much information about a business to consumers as possible. The more information you supply Google, the more Google can supply its searchers, and the more comfortable it will be ranking you higher in results. To rank higher on Google Maps, each of the below areas of your GMB profile needs to be complete, accurate, and optimized. We’ll go into more detail with certain items in the next section. 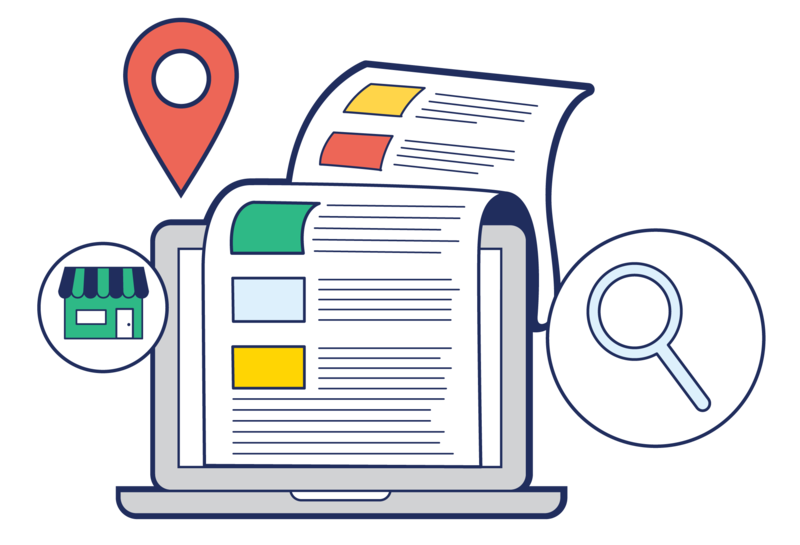 If you have a Google My Business listing, check to make sure you have all of these things in order to get your business ranking higher on Maps. If you want help assessing your profile, use our free tool below. Google isn’t keen on toll-free (800 and 877) numbers because these types of numbers are frequently used for spam. Use a local telephone number with the area code of your location. This will help you to rank higher in Google Maps, and will also verify for searchers that your business is a brick and mortar location in the area. Don’t use a tracked phone number in an effort to segment customers coming from Google Maps. There’s a right and a wrong way to do this; the right way is complicated and the wrong way could damage your rankings. Google Maps tells users if a business is open, closed, or opening or closing soon. Adding business hours to your listing can give potential customers the impetus to use your business. Your Google Maps listing has a character limit, so keep your description succinct and include local SEO keywords. For example, instead of “great realtor offering exemplary customer service”, try something like “Dallas realtor with best rates”. For more help, head to our post on How to Write Your Google My Business Description. In terms of ranking, the category field of your Google My Business profile (and Maps listing) is the most important attribute. Google can detect category information from your website and other mentions of your business across the web, but it’s important for you to go in and manually add as many relevant categories as you can. To add categories, type in keywords to describe your business and Google will display matching categories from which to choose. One of the easiest ways to stand out on Google Maps is to add photos to your Google My Business listing. Choose high-quality photos that capture what it’s like to be at your business, during operating hours. You can add more than one photo so choose ones that will entice customers to come to your business. Listings without photos are less appealing to consumers and may not rank as high as listings with photos. Google reviews add trustworthiness to a business, so Google ranks businesses with a high volume of good reviews higher on Google Maps. Keep in mind that, once you open up your business for reviews, there is no turning back. As with other review sites like Yelp, you will not have control over what people say, so your reviews may be both good and bad. However, unless your service is truly atrocious, bad reviews, statistically speaking, tend to be far and few in-between. Plus, as long as you respond to negative reviews properly you can mitigate and even reverse the damage. 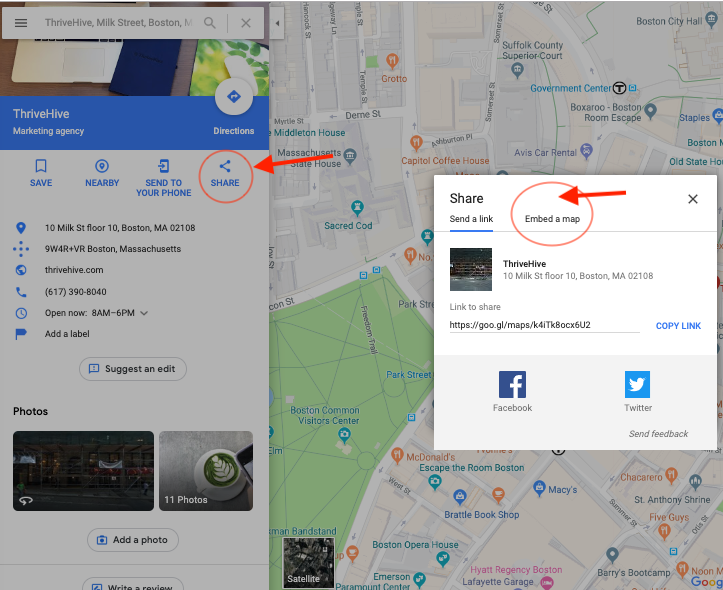 To get more Google reviews, obtain the link to your Google review form: go to your Google Maps listing, click “more information” and copy the direct link you find there. Share this link via social media and email to encourage reviews. You can also create a landing page on your website that leads directly to your Google review form. To give yourself a boost, ask a handful of trusted, loyal customers (ones who you know will leave you a positive review) to write a review for you. Just a few positive reviews will be enough to rev up your rankings. Google will discredit businesses with multiple phone numbers or locations listed for one actual business. Weed out duplicate listings and superfluous information to ensure your one true listing will rank. In addition to optimizing your Google My Business listing, you should also make sure your website is in line with local search best practices. Here’s what you can do to your website to make sure it supports higher Google Maps ranking. Google ranks its results in an effort to provide the best possible experience for its users. The majority of Maps and local searches are performed on a mobile device, so if your listing links to a website that requires pinching and zooming, has broken links, or is slow to load, your ranking will suffer. A responsive website functions consistently across any device or screen size. Make this a priority. Make sure the important pages of your website are optimized for location-based searches. This means placing geographically modified keywords into their titles, headers, body, image tags, and URLs. For more help with local SEO, check out our post How Local Businesses Can Improve SEO: Tips for Ranking on Google. Another way to rank higher on Google Maps is to embed a Google Map on your website. Most businesses place a map on the contact page of their site. Embedding a Google Map is just another way to telling Google that your business is located where your listing says it is. Use the same address that you have on your Google My Business listing. To embed a Google Map on your website, search for your business name in Google Maps. Click on “Share” in your listing and select the “Embed a map” tab. Copy and paste the link on your business’s contact page. Business listings on Google Maps are becoming more advanced, allowing consumers to more quickly get the information they need in order to make a decision about your business. Make sure your Google My Business listing is in top shape so you achieve and maintain a higher rank on Google Maps.